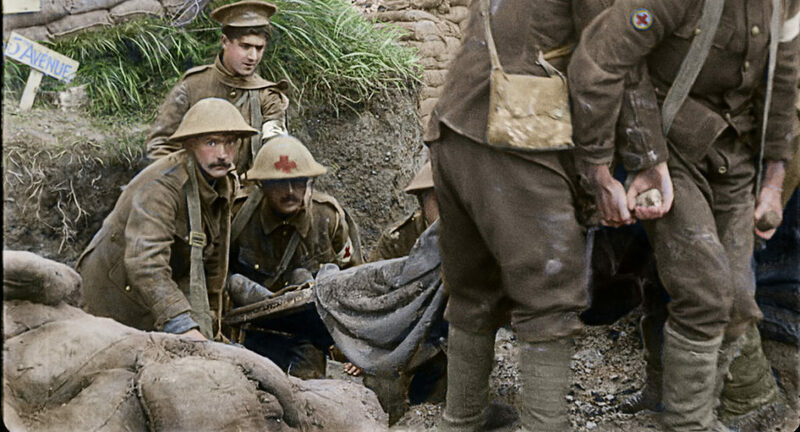 Peter Jackson’s documentary “They Shall Not Grow Old,” which is getting a limited theatrical run in Boston beginning Feb. 1, is a time machine back to the First World War. The film begins with black and white vintage footage from the war of young, White British men signing up and entering training and boarding ships to France. Once they land on the continent, the footage shifts to color—like “The Wizard of Oz”—magically transporting us to the splintered trees, the pulverized fields, the muddy trenches of the war’s western front. Kablam! 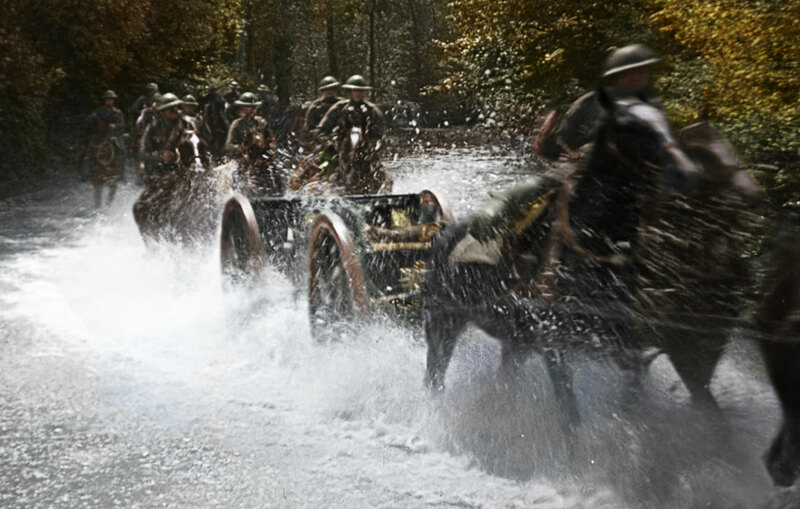 Britain’s Imperial War Museum invited Jackson—the director of “The Lord of the Rings” trilogy and other special-effects-filled fantasy war epics—to mine their World War I footage to create a documentary to commemorate the hundredth anniversary of the war’s end. Movie cameras in the 1910s were generally hand-cranked, causing variations in speed that make everyone appear to be madly skittering around. Jackson’s team stabilized the footage and corrected its speed. “When you get that speed spot on it suddenly comes to life,” Jackson says in a documentary accompanying the film. It’s true. Just that change makes everything click into place. 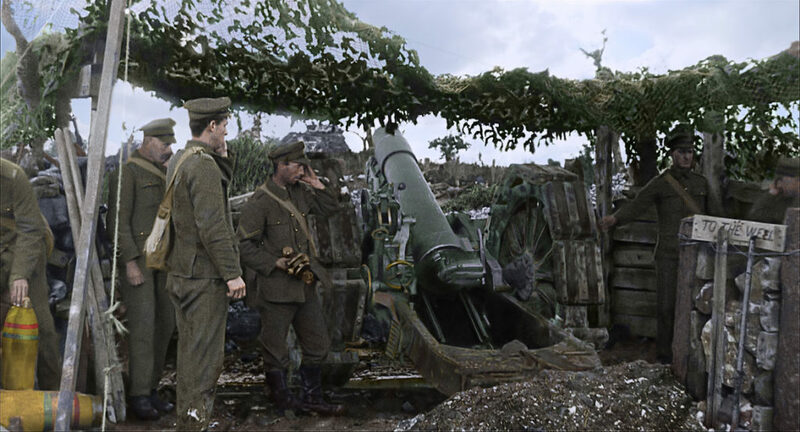 Then Jackson’s team colorized the footage. It feels colorized, like a hand-tinted photo. But it clarifies the action, the British khaki, the German gray. Then they added sound to the silent footage—dialogue, clanking gear, steaming tea kettles, horses, bagpipes, tanks and, most harrowing, the murderous whistle and gut rumbling blasts of artillery. Jackson’s teams used new recordings of actual vintage cannons plus target practice by a contemporary New Zealand artillery unit. Speed, color, sound transport us into the trenches. The combined effect is astonishing—a time machine bringing the long gone soldiers back to life. So far, so incredible. The problem with the film is the story Jackson tells. His approach to the narrative is impressionistic—a collage of 1960s and ‘70s interviews with British veterans and their creaky regional accents atop the restored footage. The story here is familiar—civilians signing up in droves because everyone else is doing it (“We couldn’t possibly lose,” “I was dead scared that the war would be over before I got there”), shocked and transformed by training, then the trenches, and the appalling tactics. Soldiers were told to walk across muddy fields and blast craters toward endless barbed wire and blazing machine guns. The plan was criminally awful, the fatalities unfathomable. Jackson favors small details—the way a British soldier intentionally bumps into a German prisoner, the way a man plays a bottle like a guitar, the way the fellow smile and laugh. It humanizes them. These aren’t silent ranks of soldiers rushing around in speed-up footage, but familiar young men. This brings the carnage closer to home. The waste! And for what reason? Jackson doesn’t bother getting into it. Because Jackson doesn’t worrying about the details of specific men or units, the result is a generic war story, an uncritical cliché of youth and blood and valor. At the end, Jackson strikes mournful notes, but really you feel he’s still thrilled by the movie footage of daring-do.